Do students learn better by typing on a keyboard or writing with pen and paper? In 2013 Patricia Ann Wade, a learning specialist with Indiana University's School of Medicine, found herself investigating this question, one she had been asked by time-crunched medical students again and again. The answer, she found, was not simple. "If they were in a lecture, where the professor talked so quickly that even if they were typing they couldn't get down everything said, I would say, 'Go with typing as opposed to handwriting,'" Wade told The Huffington Post. "If all you're doing is acting as a scribe, there are clear benefits to typing." But there were also strong arguments to be made for old fashioned pen and paper, she discovered. 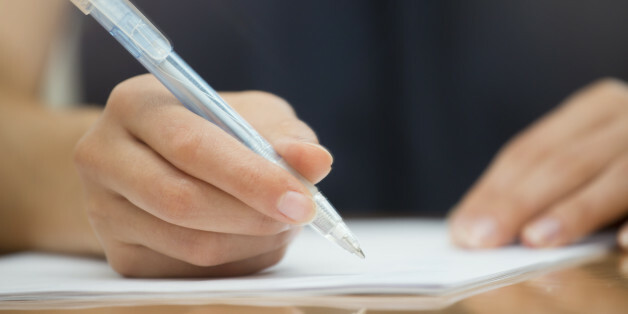 Ultimately, "when it comes to learning and remembering course material, the pen is mightier than the keyboard," she wrote in a blog post on the topic, for the medical school's website. It fires up the brain in different ways. In a small study published this spring, researchers had college students listen to various TED lectures and then take notes -- either longhand or on their computers. Students who typed were more likely to take notes verbatim, which "hurts learning," the researchers concluded. And indeed, those students scored worse overall when tested on their grasp of the facts and their conceptual understanding. "Study after study suggests that handwriting is important for brain development and cognition," argued a 2010 article from The Week, citing work from University of Wisconsin psychologist Virginia Berninger, who has tested school-age children and found they tend to generate more ideas when composing essays by hand, rather than on the computer. "Writing entails using the hand and fingers to form letters ... the sequential finger movements activate multiple regions of the brain associated with processing and remembering information," echoed Wade. It slows you down. In a good way. The average person types between 38 and 40 words per minute, which has clear benefits when speed is the primary objective. Writing with a pen and paper, on the other hand, "requires more mental energy and engages more areas of the brain than pressing keys on a computer keyboard," Wade wrote. And because it is slower, handwriting can be particularly useful during goal setting, brainstorming and the so-called "retrieval phase of studying," she argues -- all pursuits that require time and deliberation. "When you're writing out something, the natural inclination is to do it as quickly as possible so you can get it over with," echoed Thorin Klosowski, in a LifeHacker post on simplifying one's life through the use of pen and paper. "Paper slows me down and forces me to think a little bit longer about what I'm doing." As Dustin Wax put it on Lifehack, "The tried and true tool of choice for tens of generations of monks, philosophers, and scribes, pen and paper are still a valid choice when you need to focus." This last one is impossible to quantify, of course, but as writer Lee Rourke explained in a post for The Guardian (called, appropriately, "Why Creative Writing Is Better With The Pen"): "For me, writing longhand is an utterly personal task where the outer world is closed off, just my thoughts and the movement of my hand across the page to keep me company. The whole process keeps me in touch with the craft of writing. It's a deep-felt, uninterrupted connection between thought and language which technology seems to short circuit once I begin to use it." The legion of famous writers who purport to use only pen and paper suggests there might be something to the notion that it somehow boosts creative output: Quentin Tarantino claims to write all of his scripts longhand, telling Reuters, "I used red and black [pens]. One of the great things about being a writer is it gives you complete license to have whatever strange rituals make you happy and productive." Joyce Carol Oates now writes the first draft of all of her novels on pen and paper, as does Jhumpa Lahiri, according to Mashable.